Creating a model within a model has been a successful path for Viking as demonstrated by the Viking 44 Convertible and 44 Open, which share the same hull with uniquely different deck and interior arrangements. The popularity of these new models has encouraged us to expand this theme with a pair of new 44s with striking profiles and special features that showcase Viking’s ability to broaden the appeal of this versatile hull. Using our $1million five-axis profiler, we designed and built a plug and a female mold to create a rakish fiberglass deckhouse module, fully open to the cockpit while incorporating stylish convertible window lines and a roof overhang. Built into finely tool hardtop is a pair of easily accessed rod stowage compartments. 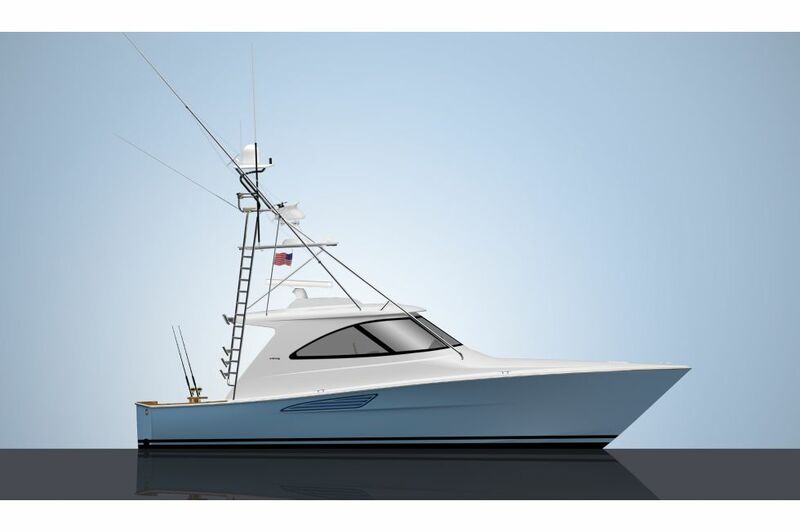 The Viking 44 Sport Coupe has a distinctive New England or Great Lakes flavor for cruising efficacy and includes a choice of a custom fiberglass mast for the radar and other antennas, or a customized radar arch. The 44 Sport Tower will be a sharp looking rig with its fitted Palm Beach Towers’ tuna tower. Add a pair of outriggers and this boat is an ideal ride for the sailfish circuit, cobia hunting and cruising throughout the Bahamas. In their 119-square-foot cockpits, both the 44 SC and 44 ST sport the familiar starboard mezzanine seating arrangement of the popular 44 Open. Engine room access is provided with a convenient centerline hatch that’s integral with the mezzanine seating. The SC and ST have been engineered for the installation of a Seakeeper gyro stabilizer, which brings great stability to the vessel to increase overall comfort. The command deck includes our signature and tournament-proven centerline forward helm station on a raised platform for enhanced visibility. The console holds a bank of electronics displays, and has space for engine instrumentation and other accessories. Recessed compartments accommodate radios and additional equipment, plus accessory switches and controls. Like all Vikings, the 44 SC and ST can be appointed with custom Atlantic Marine Electronics' packages for navigation, communication and entertainment accessories, and using this Viking subsidiary allows the yacht to be delivered turnkey ready. Twin MAN 800-hp diesels serve as the standard propulsion package. The engineroom, lazarette, forward bilge and anchor locker are all painted with Snow White Awlgrip for maximum visibility and easier maintenance. A Delta-T engineroom ventilation system, an oil exchange system and an Onan 13.5 kW E-QD (electronic quiet diesel) Series generator are just some of the standard mechanical and electrical equipment. We encourage you to contact your Viking dealer to learn more about these special edition models and availability.